Most of us here are far too young to remember this, see but when Dr Martin Luther King, seek Jr died he was extremely unpopular in the mainstream US media – primarily because of his stance on the war. This sermon could have been delivered this morning and still have been relevant. I’m of course not satisfied with this, because it’s really not possible to do the original justice, but this is what I’ve got. I really could have just thrown the acapella on here, that’s a good enough #100 for me. They say we’ll nod our heads to anything said over a beat and they lament the fact that too much of what is said over those beats is destructive. So here’s something good to nod your head to. Words: Dr. Martin Luther King, Jr – The Drum Major Instinct Sermon. Delivered 4th February, 1968. He was assassinated two months later, to the day. 0’35 – Jay Electronica – The D.O.C. Song (loop). This is really just a loop taken from the beginning of Jay’s song by the same name. Not sure what the title of the cut means. 2’58 – P Dukes – Brown Leaves. 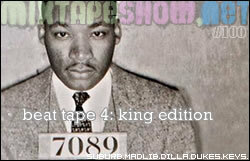 5’40 – J Dilla – Anti-American Graffiti (Reprise). Kinda hard to do one of these without the D on here. 6’45 – Suburb – Jazz on Acid. 9’00 – Kenny Keys – Set ‘em Up. Mean cut. 10’40 – Madlib – Old Age (loop). 11’45 – Ayatollah – Listen. 13’40 – Madlib - Pyramids (Changes). If you don’t already own everything that Madlib has put out, you should probably get started now. Stones Throw is a label worth supporting. 15’30 – Suburb – synth+strings. Do yourself a favor and make sure that you listen until the end. This entry was posted in episodes and tagged beattape, episodes, j dilla, jay electronica, kenny keys, madlib, p dukes, suburb by dex digital. Bookmark the permalink. that’s what i’m supposed to do right? This is a pleasant surprise! It’s not what I expected for 100 but I like it. the king with the king of hiphop podcast ..congrats..happy b-day mr king..his sermons applies to today ..
MLK. there will never be another. thanks for the whole mixtapshow! The drum major metaphor can empower & condemn simultaneously. one of the best if not the best……..keep it up dex digital soul tronica next hopefully R.I.P MLK main i hope none kills Borack Obama…. Brer – yeah, the focus of the show is King, not the beats. Don’t worry, though, there’s a B-side + bonus beats edition to this episode on the way in a few. Vince – yeah. I think this speech should be required listening for anyone even considering a position as a public figure of any sort. also for future supervisors at office jobs..(not trying to be funny)…this is a good sermon for everyday life! sweet show displaying a wonderful orator not afraid to walk head on to a death he spoke so about. lighters up for the one hundredth, congrats dex. I was not there for the event of course, but I do remember portions of that speech being played over and over after his death. He is the most important man of peace ever! this nation would have fallen in on it’self were it not for him. Iain – yeah, the first time I heard him speak I noticed that. He kinda bites the aesthetic without all the substance – but I think he’s sorta being pressured into doing that. Vince – good links. I wasn’t aware they’d done a video for that joint. And that poem sums up pretty well what they’ve done to the man. Thank you. i saw that on somebody’s facebook earlier – guess i’ll have something to watch later when i’m laid up after i get my wisdom teeth pulled. And yeah – that picture is pretty great. Powerful…i was listening to this today on the way to work. And I’ve spent the past few days really listening to the political candidates and Bush and all that. I’m blown away by how relevant this still is right now. I mean its like if you just crossed out Vietnam and inserted Iraq…somebody slide this cd onto George’s desk please. We need another brilliant mind for change like Dr. King. Fresh – yeah fam. Unfortunately a lot of his message has been forgotten/deliberately obscured, but that’s the beauty of the internet – we can dig it back up again and remind ourselves of the original purpose. Yes, yes, yes. That is exactly it. …so you know you’re a genius for this right?